Two different housing associations have been to visit the allotment project in the space of a week. Rhondda Housing Association enjoyed a sun-soaked trip to the Leckwith Allotments to discover what has been going on. They have a couple of growing projects in mind with tenants in the Rhondda Valley and we may well be discussing their ideas again with them at some point. Pembrokeshire Housing Association, whose tenants also have a keen interest in outdoor projects, joined Taff tenants the following week for a more soggy visit and they were impressed with the range of facilities. The key difference with that visit was it came directly after the Allotment Open Day! So there was quite a lot more to see, including the rainwater tank on the training shed, which the tenants were impressed with. We also had some presents to send our visitors way with – potted up calendula seedlings, which was well received by the Pembrokeshire group. We were glad to re-house the plants, as we need the raised bed (the plants had self-seeded from last year!) for another disabled tenant to use. 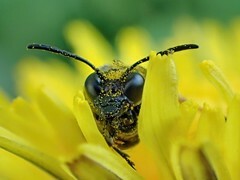 We are pleased to be getting more people involved in the project, week by week, after a terrible spring put off some of our tenants and volunteers. 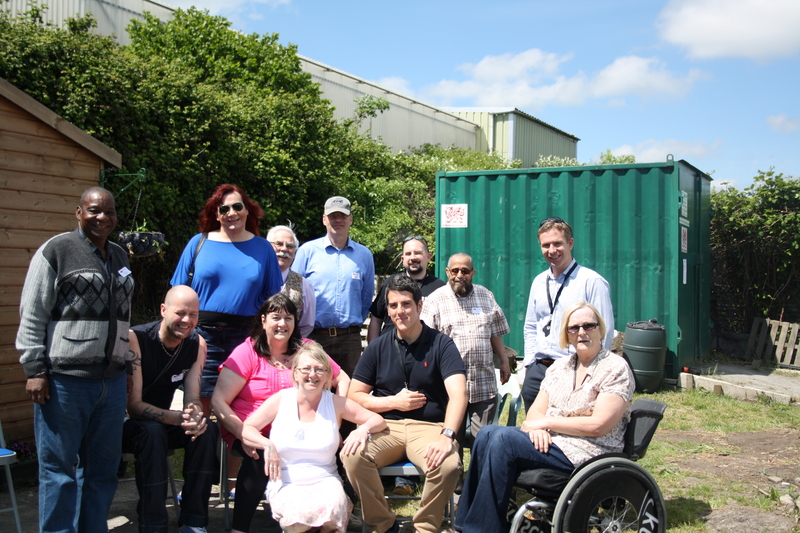 The allotment project enjoyed another great day in the sunshine, as contractors, staff and tenants all rolled up their sleeves to make improvements to the site. Cowlin Construction stepped in to create two 2m x 2m x 1m raised beds from wood, which will benefit one of our disabled tenants. We are now busy trying to source the necessary materials – stone for drainage, green material and compost – to fill the beds. Willis Construction did a great job fitting together the guttering to a giant water tank – about 600-litres – at the rear of the training shed. The tank, which is shaded, will act as a great source of fresh water for tenants to keep up with tending to their crops. Staff and plot holders at the Leckwith Allotments pitched in to finish off work on the fruit cage, barrowing in wood chip, planting up more fruit bushes – tayberries, loganberries, blackberries – and then putting up the netting to protect the fruit. The original potting shed was lifted to help move the slabs to lay a new base for its future home by the training shed. This needs to be cemented in place, as the ground itself is a bit spongy and a strong base is required. This shed move will free up the original spot to site a proposed poly tunnel, which the allotment group is seeking grant funding for. Other staff got involved in creating a smaller open fruit bush plot, measuring about 3m x 3m, opposite the fruit cage, which raspberries were planted in – these tend not to draw as much attention from the birds, but we will keep a close eye on them! Meanwhile, there was plenty of activity elsewhere on the plots, with window planter boxes being put up round the site on the boundary fencing, which bought from the Vision 21 charity. The disabled raised beds were turned over, with the herb bed cleaned up and re-planted, the strawberry bed was topped up with more plants and a group of staff and tenants helped plant seeds into other raised beds. 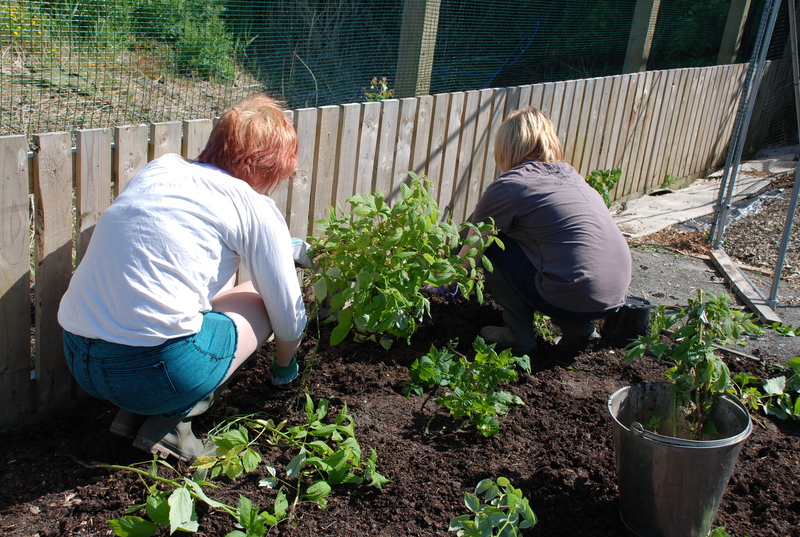 The New Foundations Home Education Project were busy working on their own site, while staff helped out with the Community Growing Space, digging the area over. All in all, it was a great day out, with a lot achieved and the tenants were very happy. A big thank you to all the staff, contractors and other plot holders who were involved on the day. Their help is much appreciated.